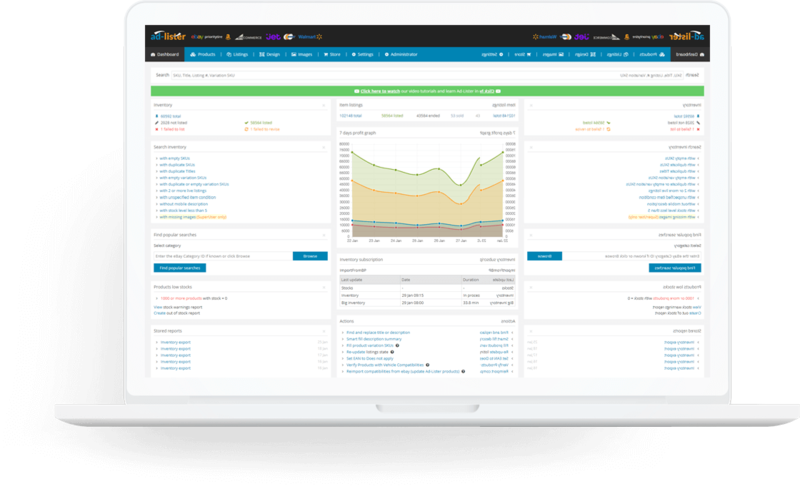 List and manage your products online across multiple sales channels. Ad-Lister allows you to manage your products and then upload them to multiple sales channels when ready. Save time with our product editor, which allows you to bulk change postage options, prices, stocks, and many more. 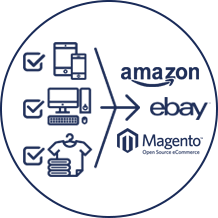 Setup is done easily by importing your products from eBay, Amazon or Magento. 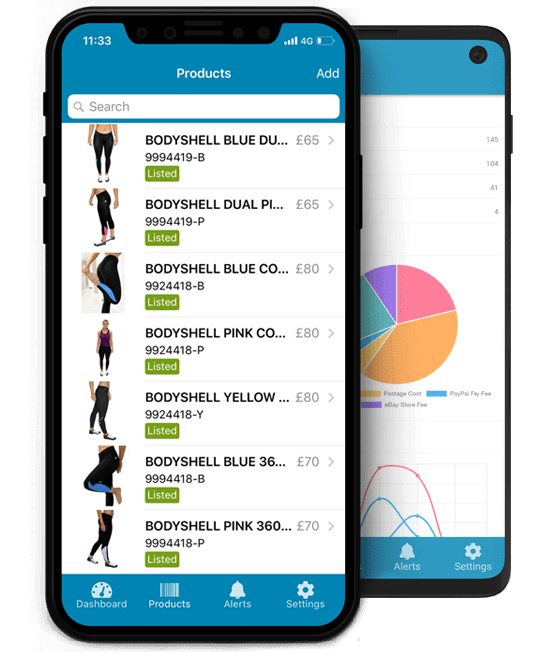 For users on the go, we have a mobile app that allows you to quickly add eBay products using a barcode scanner that will use eBay’s Catalogue to automatically fill out your product details. You can also use the mobile app to take pictures of your products and upload them to Ad-Lister. Scan to add a product Scan the product's barcode and let Ad-Lister take care of the rest – using the eBay Catalogue, our listing tool will auto-fill the fields required by eBay to list the item. Upload images within seconds You can take and upload images of your products no matter where you are, it only takes a couple of seconds to make a quick snap and update the product image.  Push notifications Get notified when Ad-Lister has finished certain tasks – such as bulk listing/updating your products on the different platforms. Ad-Lister comes with a built-in Template Builder that allows you to create listing designs in minutes. Creating eBay listing templates has never been easier – just drag and drop the desired elements on your listings and add custom campaigns such as Best Sellers and Related Items to promote your products. Apply your design immediately to thousands of live listings with one click. 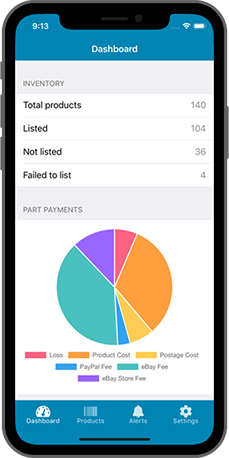 Our eBay listing template builder allows you to choose from a selection of mobile-friendly eBay listing designs and customise them to meet your requirements. Increase sales and stand out from your competitors by using our attractive mobile responsive listing templates. Check out our all-in-one listing tool List products on eBay, Amazon and many other marketplaces using our secure, mobile-friendly, streamlined solution. Secure your eBay or Amazon account with Ad-Lister without sharing your passwords. 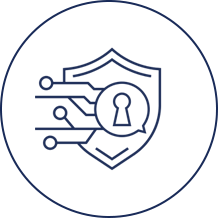 Our multi-user feature with restricted access is ideal for multiple people within the business, eliminating the need to share your eBay, Amazon or website logins with your staff. List and manage hundreds of products easily with our bulk listing tool. Ad-Lister makes the process of listing and managing your products in bulk seamless. You can choose to edit them using our interface or you can export the items to a CSV file, and then upload them back into Ad-Lister once you've finished making your changes. Automate your workflow with ease by using Excel or CSV files, APIs or custom data links from your suppliers to populate your products in Ad-Lister. 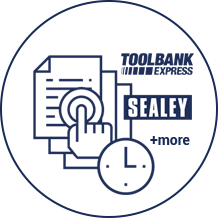 We already have data links from over 20 suppliers, such as Toolbank & Sealey, allowing you to select the products you wish to sell and then automate their stock levels, prices, descriptions and many more. Our multiple pricing options were made to suit businesses of all sizes. The license tiers are based on the number of products in your inventory. To see which plan suits your needs, please check out the slider below. * Cancel or change subscription at any time. Clients Feedback Why others love us and what they say about us. We at Priority Tire Outlet found out about Just Applications Ltd company through Ad-Lister listing tool, that we love to use. We can only think, after using this web development tool that was so easy to integrate with, easy customizable and easy to use, that with Just Applications everything is possible. Fantastic Company, extremely helpful staff, their eBay listing template feature is the main selling point of our account with Just Applications. Would recommend to any small/medium size eBay business. A great product for managing your eBay listings from a very professional company. Customer support is excellent with a fast response every time from the support team, highly recommended. Great product. Professional service. Immediate response every time from support team. Very professional team, very helpful every time I asked them to help with a certain issue, would recommend the company.